A video demonstrating the stepping reflex in newborns. 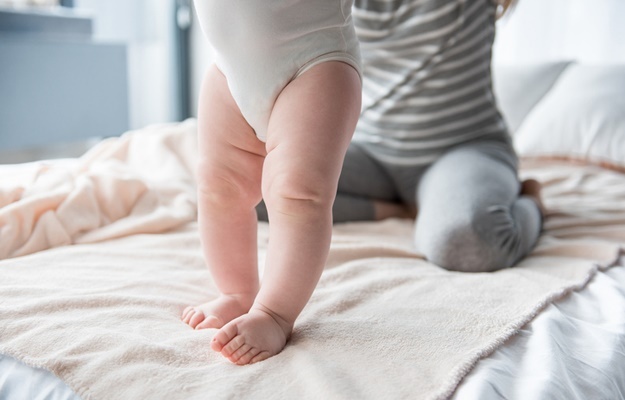 The stepping reflex in newborns is also known as the "walking" or "dancing reflex". This reflex can be seen when a baby is held upright or when the baby's feet are touching the ground. It is prevalent from birth but gradually disappears by the time the baby has reached 2 to 3 months. This reflex occurs as a means to help develop proper development of the leg muscles and movement. If this reflex does not occur in a newborn, it may indicate a motor nerve defect or a neurological malformation. Sometimes, this reflex will appear when the baby's lower half is submerged in water. A newborn baby in Brazil had midwives convinced she could walk after her stepping reflex took effect just minutes after she was born. Sources: Children's Hospital of Philadelphia and PregMed.